In spite of the gradual influx of supermarkets, commercialization, and modern changes in culture and habits, Rome still has several authentic neighborhood food markets which provide a welcome respite from the crowds and transport you into the rhythm of daily life in Rome. Whenever we travel we love to visit the local food market. Not only is it fascinating to see the variety of products on sale, but it also offers a glimpse of the local people and, more often than not, will prove to be the most vibrant, colorful place in any city. The same goes for Rome, so we have put together a selection of our favorite markets in Rome for food-lovers. The biggest market in town, the Trionfale market, which is located close to Vatican City, has a seemingly endless array of stands which cover all foodstuffs. Take a walk through the 270 stalls the market has to offer to see and smell the freshest ingredients from all over Italy and with many vendors working the try-before-you-buy tactic you can also sample the goods. Take a tour of the Mercato Trionfale before our morning cooking classes. A true farmers’ market where producers sell their own goods, the Campagna Amica market around the corner from the Circus Maximus takes place on Saturday and Sundays. As well as a wonderful place to buy typical foods from the local Lazio region, there is also plenty to eat so you can taste while you shop. 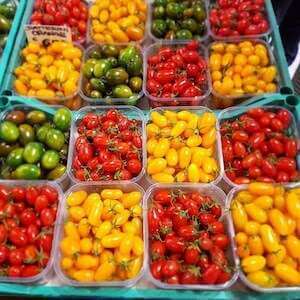 Visit the Mercato di Circo Massimo on our Sunday Farmer’s Market Tasting Tour. Also known to Romans as Piazza Vittorio, this is the city’s raucous international food market. With vendors hailing from all over the world and loudly jostling for business, this is the place to come to buy unusual vegetables, Asian ingredients, and foreign herbs and spices which are hard to track down elsewhere. Trastevere’s morning market is a laid-back affair and a major hub of the neighborhood’s social life. Pretty Piazza San Cosimato forms the picturesque backdrop and the soundtrack is provided by children playing in the square and the locals gossiping as they shop. The dozen or so stalls include everything you need including fresh produce, meats and cheese, a butcher and a fishmonger. The local market of the Monti neighborhood (a short walk from the Colosseum) has recently come back to life after a period of almost complete abandonment. Tucked away down the district’s stunning cobbled backstreets, this small covered market now offers a good selection of stands selling everything you need for a real Roman dinner. The market of Rome’s Testaccio neighborhood is an intriguing mix of traditional family-run stalls which have been passed down the generations and newer outlets selling street food which began to appear when the market moved to its larger, more modern premises in 2012. The market draws not only the local Testaccini residents but also people from across the city who come to eat and soak up the lively atmosphere. Discover the Mercato Testaccio with us on our Testaccio Market Tour. Visit some of Rome's most vibrant and lively fresh produce markets. Foodies will love exploring the sights, sounds, and tastes of these fabulous food markets.